Since 2008, I've been gradually making my way through the United States in an attempt to profile a college radio station from every state in order to bring to light some of the intriguing radio stations located in both expected and unexpected places in every corner of the country. So far, I've made virtual trips to Arkansas, Wisconsin, Kansas, Louisiana, Alaska, North Dakota, Nevada, West Virginia, Kentucky, Minnesota, Montana, California, Nebraska, Idaho, Tennessee and South Carolina. My next stop on the Spinning Indie 50 State Tour is WTJU at University of Virginia. 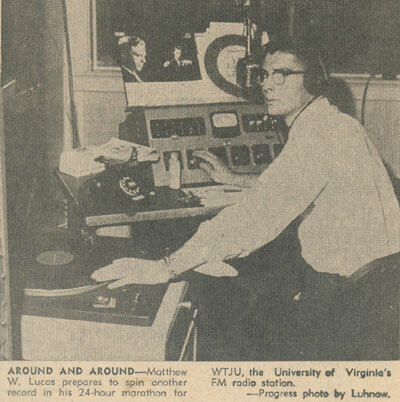 WTJU has been around for 55 years, having been founded in 1957 at University of Virginia. WTJU was the second station started up by the Department of Speech and Drama (the first station, campus-only AM carrier current station WUVA, began in 1947 and is now an FM commercial station). By 1963, WTJU became a separate student organization. In the years since its founding, the station has increased the number of broadcast hours, has added community volunteers, and has branched out from its early staple of classical music programming to a wide range of sounds as well as a variety of public affairs programs. In honor of WTJU's 50th anniversary in 2007, a special section of WTJU's website was created in order to compile tidbits of the station's history as well as to archive audio and materials from anniversary celebrations. This June, in honor of the station's 55th anniversary celebration, WTJU General Manager Nathan Moore reached out to me. He told me that around 150 people attended the 55th anniversary event on June 2, 2012. Alumni were able to tour the station, get back on the air, and attend a reception and after-party. Moore told me that efforts to archive the station's history are ongoing and plans are in the works for a "searchable digital public archive of WTJUs history." Moore told me that this year's anniversary party gave him an interesting glimpse into how the station and the university had changed over the years. 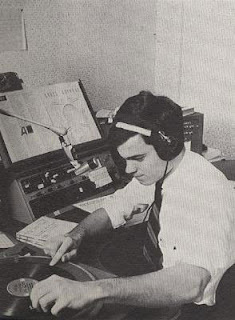 He explained, "In 1970, WTJU was still a virtually all classical station. It was also all male – UVA didn’t accept women (except to the Nursing school) until Fall 1970. The station’s student management looked something like this. By 1980, the student management looked like this. It was a wild, sometimes anarchic place with rock, jazz, classical, and a few folk shows. The Rock Director had to remind DJs to not smoke pot in the studio. She had to put a stop to a DJ doing lines off one of the turntables." He also explained that WTJU was full of indie rock luminaries in the 1980s and 1990s. According to Moore, "The 1980s and early 1990s at WTJU were the first heyday of college radio – at least as we think of college radio today. Stephen Malkmus was a DJ. James McNew (from Yo La Tengo), David Berman (from Silver Jews), and Rob Sheffield (Rolling Stone critic) were DJs. And a whole lot of other tremendous and passionate people who went on to do other great things, but who aren’t so well known for their work in the music industry." Moore told me that WTJU didn't have any paid staff until 1993, when the station hired Chuck Taylor as its full-time General Manager. Taylor retired in 2010 and was replaced by Burr Beard. Soon after Beard was hired, he proposed major programming changes at the station (which I reported on for Radio Survivor in June 2010). His proposal sparked outcry among WTJU's volunteers and even led to the creation of a website called WTJU in Crisis, described as "a clearing-house for the community to encourage full transparency of the changes that are being made to WTJU, The Sound Choice in Central Virginia." 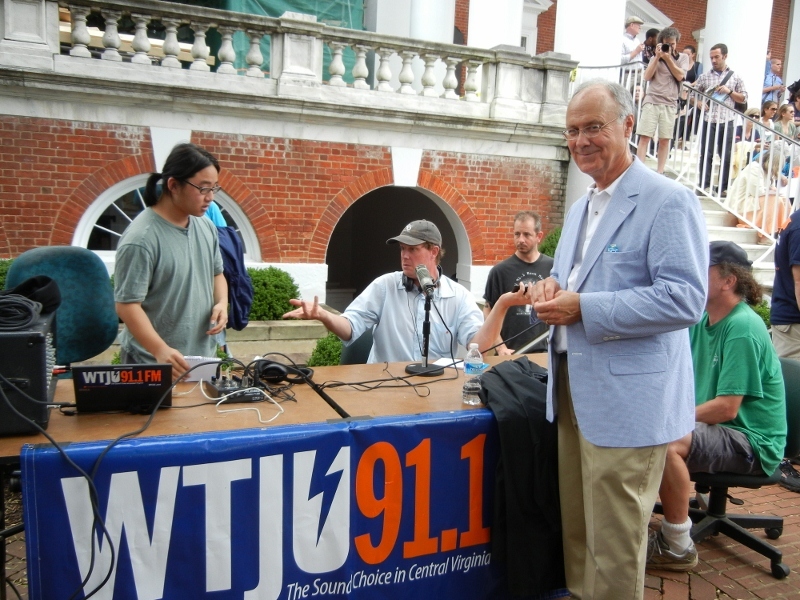 By October, 2010, Burr resigned from WTJU. Moore replaced him as General Manager in April, 2011. Moore, a former college radio DJ himself, answered some questions for me over email in order to give me a sense of how WTJU is doing today. In our interview he talks about efforts to recruit more students to the station, the role of physical music at the station, and how WTJU is enmeshed in the local music scene in Charlottesville, Virginia. 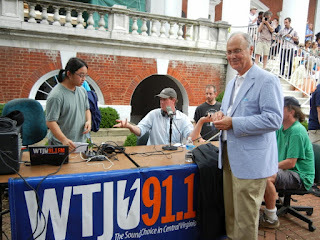 Dave Moore (in black shirt, also a rock DJ), and John Casteen, former UVA President. Spinning Indie: What's your background in radio? Were you involved with other college radio stations? Nathan Moore: I started as a college radio DJ at WWVU in Morgantown, WV back in 1998 [and] was a rock DJ for all four years of my college tenure and a talk show host, jazz DJ, and News Director for two years. After graduating, I went to grad school in Madison, Wisconsin [and] got involved as a volunteer at WORT, the community radio station up there. In 2004, I was hired as the full-time News & Public Affairs Director at WORT. In 2007, I was hired as the National Programming Coordinator for Pacifica Radio, and then from 2009-2011, I was the General Administrator at Free Speech Radio News. Spinning Indie: How are your efforts going to recruit more students? What percentage students/what percentage community members do you have on-air? Nathan Moore: Efforts are ongoing. Progress, but there's more to do. Last year, we did some outreach tabling, flyer drops, and publicity through UVA departments. This year, we're also putting together three free concerts geared toward campus, including an election night concert and a pretty big battle of the bands style event in the spring. Non-student community members still constitute the large majority of on-air staff, though all our departments are working on bringing in more students. It's easiest to recruit more students for rock, news/talk, and folk & world. A bit harder for classical and jazz, though we've gotten a few more student DJs in those departments, too. Nathan Moore: Oh geez, probably. WTJU was a nearly all-classical format from its founding in 1957 until 1970 or so, and we have a lot of very old classical LPs. But I honestly haven't taken a thorough inventory. I'm a little bit too young to have grown up with vinyl as the dominant technology, but a little too old to embrace it as a hip way to listen to music. Spinning Indie: Does WTJU add vinyl? cassettes? How big is your collection of vinyl and do DJs embrace it? Nathan Moore: Definitely vinyl. Our rock department auto-adds vinyl. Cassettes no. We don't even have a cassette deck hooked up to a board anymore, though we do have a cassette deck in the production studio rack, should we ever need to pull some old audio off of an old tape. A lot of DJs here are definitely into vinyl. Old-timers and undergrads alike. I'm pretty sure we're the last station in town playing vinyl on-air. Spinning Indie: Do you add digital releases? Nathan Moore: Yes, though we mostly still get CDs from the labels. But yeah, in the last six months or so, we installed a 12 TB music server. We add new music to it, as well as ripping our CD collection to it. It's a rather tedious process, but it'll open up new creative possibilities once it reaches critical mass. Spinning Indie: Do you have any specific programs/specialty shows that are unique to WTJU or stand out as being different from anything else on radio? -- Soulful Situation: Dixiefried southern soul, uptown northern R&B. Classic tracks presented with much bravado by Rumcove (aka Robin Tomlin). Monday afternoons 12-2pm. -- Gamut: the gamut of classical music from the middle ages to present. The DJ (Ralph Graves) has never repeated a track since he started hosting the program in 1984. Wednesday mornings 6-9am. -- The Broadcasting System: A truly freeform radio show that speaks to the incredibly independent spirit of WTJU. Host Tyler Magill recently played Stereolab, Ornette Coleman, and the sounds of woodpeckers in the same half-hour. And it kind of worked. Mondays 2-4pm. -- Deepest South: This is probably my favorite new show that we rolled out with our July program changes. It's this tremendous genre-agnostic show that redefines how we listen to Latin communities across the globe. Steve Villereal and Anne Dunckel alternate, Thursdays 12-2pm. Spinning Indie: What is WTJU's role in the local music scene? Nathan Moore: We support the local music scene and it supports us. We do artist interviews and live on-air performances, and we play a lot of local bands' albums. We even have a weekly folk show called "Around This Town" that features artists coming to town in the next seven days. We do promotional trades for a lot of shows. We provide a platform for an awful lot of live music, especially in the local folk & roots music scene. We aired eight or nine live shows from venues around the area in the last year. All of this crosses genres, too – our folk department has been the most active in the local scene, but the rock, jazz, and classical departments have been doing all of this, too. Spinning Indie: Can you tell me a bit about your new public affairs shows? Nathan Moore: There's a ton of public radio in Charlottesville – three NPR services, in fact, which is a lot for a market this size. But they're all translators for stations that are elsewhere in the state, which means they're not covering Charlottesville stories with the kind of depth and discussion that they deserve. 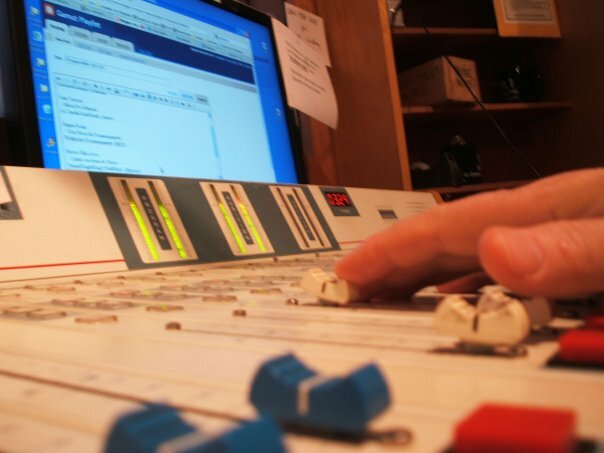 Our new show "Soundboard" dives into hyperlocal Charlottesville affairs and also connects national stories to our community, weekdays 9-10am. Right now, we're only producing the Thursday and Friday shows locally, but that'll expand to five mornings in the coming months. The Friday edition of Soundboard is a terrific partnership between us, the alt-weekly C'Ville, and Charlottesville Tomorrow, a hyperlocal online news site. I host the Thursday edition, and I especially like to connect national stories to Charlottesville. We're slated to roll out some weekly recurring segments as the show expands, including: backyard gardening, true stories & improv, natural history, and wine & food. (Albemarle County is home to more than a dozen wineries.) I'm also working on a content partnership with the daily student newspaper at UVA. Spinning Indie: Does WTJU interact with the broader college radio community? Do you have friends at nearby stations? Nathan Moore: Sure. We were also one of the participating stations in the inaugural College Radio Day last year, and we have a contingent that attends MACRoCk each year – the Mid-Atlantic College Radio Conference. We also are very much part of the community radio scene. We're friends with WRIR in Richmond, and I’ve got connections throughout the NFCB world.